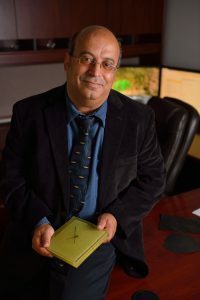 Ahmed Al-Ostaz, Ph.D., is a professor of civil engineering and Brevard Family Endowed Chair of Civil Engineering at the University of Mississippi, as well as director of the Nano Infrastructure Research Group. Al-Ostaz joined the university in January 2002. Previously, he was a visiting assistant professor at the Composite Materials and Structures Center and an adjunct assistant professor in the Department of Materials Science and Mechanics at Michigan State University. During the last 10 years, Al-Ostaz has focused his research activities on advanced materials by design. He is a founding member of the Nano Engineering Research Group, which was formed to stimulate and conduct organized research in the area of advanced materials with application to infrastructure resilience. Al-Ostaz has published more than 100 papers and supervised five postdoctoral research associates and more than 20 graduate students (mainly Ph.D.s who secured faculty positions in leading universities in the United States and abroad). He has been actively involved in steering committees for the Department of Homeland Security. He is an active member of the Objective Resilience Committee of the American Society of Civil Engineers’ Engineering Mechanics Institute and an active member of the National Graphene Association. He was selected by faculty, students, and the engineering alumni of the School of Engineering as the Outstanding Engineering Faculty Member of the Year during the 2005-06 and 2012-13 academic years.